The Wesco 10" Firestormer in black is the number one choice for firefighters and smokejumpers. These boots were designed to protect you in the heat of the moment. These versatile, leather boots can be used both in and out of the fire house. When you need to get out of them in a hurry, the Wesco Firestormers' 10" inch height won't bog you down. Being in the line of fire requires a sturdy boot designed to withstand the flames of life. 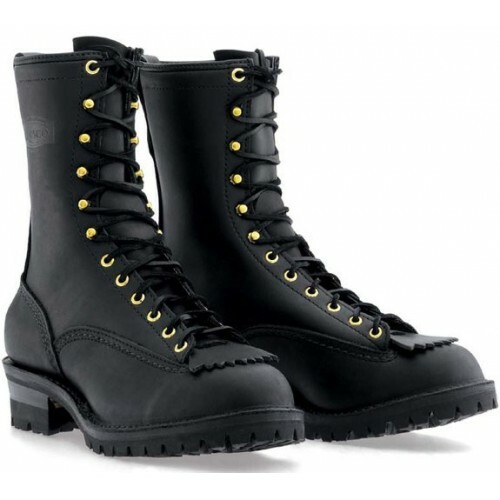 These boots come with a 100F Vibram sole, which is flame-resistant, non-marking, and oil resistant. The fires that lick at your feet will have to work hard to hurt you in the mainstays of the fire department. Kevlar stitching adorns both the upper and lower soles, and lightweight, black, no-burn stitching means never worrying when you are in a brushfire. 7 ounces of full-grain leather separate you from the flames. Finally, leather laces are included instead of standard laces because leather has a harder time burning. Much thought and consideration for the safety and wellbeing of some of America's most unsung heroes was put into the creation of this boot. Smokejumpers and firefighters need a boot that will hold up under pressure. Fires take many lives every year, and these brave men and women stand between the everyday citizen and death. Firestormers help these volunteer heroes rescue and protect. For the regulation minded, the Firestormers are also UL certified for protective clothing and equipment for wildland in accordance with the NFPA. Whether you are wearing these boots for style or work, they will hold up under fire!